I enclose a copy of the helical paper. You will note that I now include the αII ribbon among the possible structures. I found the version in the paper in a very curious way: I set out to prove analytically that it couldn't be built, and as I rotated the two residues the hydrogen bond gradually became "satisfactory!" I hope we have time to discuss this when you are here next month, unless you wish to send it off to the PNAS straight away. Watson and Crick have constructed a very ingenious nucleic acid structure which they have written (but not sent) a letter to Nature about. They will send you a copy at the beginning of next week, as Bragg is now ill with flu, and they feel he should see it before they send it anywhere. I have become (actively) interested in this problem myself, although I find I lack the necessary background, a situation which I am now remedying. Have you heard any more about the grant for the nucleic acid program that you mentioned in your letter to me on December 23, as I should certainly appreciate the "definite offer" you wrote of, as I do not have any other firm prospects at the moment. The EDSAC is at present being overhauled. When that job is finished I hope to be able to run off the three Pattersons on sheep Hb, as the experimental part is finished. I do not think this will be done until the end of next month, though. P. S. The reason that the CS2S6 structure in the February Acta still shows the alternating S-S distances is that the parameters differ from those in the MIT report you had. They differ in such a way as to preserve the alternation when the correct conversion from triclinic to orthogonal coordinates is made. 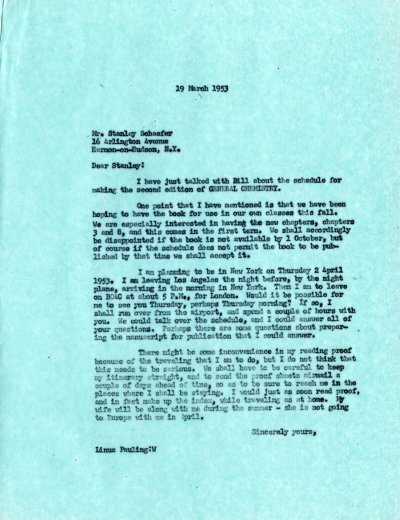 Letter from LP [signed in his absence by Beatrice Wulf] to Mr. Cyril Craig RE: Writes that he doubts that the ideas about photosynthesis that Mr. Craig suggested in his letter are really correct and sets about to describe why. [Letter from Mr. Craig to LP March 14, 1953] [Filed under C: Correspondence 1953, Box #74, Folder #21]. Letter from Theodore McClintock, W.H. Freeman and Company, to LP RE: inquiring about the usage of various units and "molal" vs "Molar" usage in LP's manuscript for the revised edition of General Chemistry. [Reply from LP to McClintock March 27, 1953]. Letter from Tomoji Tanaka to LP RE: sends a copy of the same letter he sent March 8, 1953, with the assumption that his first letter did not reach LP. [previous letter from Tomoji Tanaka to LP March 8, 1953, letter of response from LP to Mr. Tanaka March 19, 1953] [Filed under LP Correspondence: Box #410, Folder #18]. Letter from [?] to LP RE: news clipping entitled "News Guild Lists Page One Awards." Lists LP as outstanding in Science due to his research in the structure of protein molecules. [Note in pen at top: "Dir. Mail to D. Pauling, N.Y. Times: March 20. 1953"].